Woohooo!!!! The Boks have done it again. They've beaten England for the 4th time in as many months and taken the Rugby World Cup in the process. Nice one booooyyyyyyys. Pity there weren't any tries (you know it wasn't a try England), and even more of a pity Bryan Habana couldn't set a new World Cup record with 9 tries. 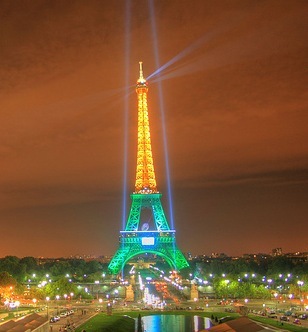 Now you know why the Eiffel Tower has been lit the way it has - the French have known from the very beginning that the Boks were going to win. It had nothing to do with the fact that the guy who's running the supporters' village is South African ;-) . A couple of things are for certain: we'll be seeing a radically different England team over the coming months, and a few changes in the Bok camp too. But keep your eye's peeled, there's a lot of talent coming through in the form of Fourie Du Preez (I think he'll be the next SA captain), Bryan Habana, Francois Steyn (what a boot this boy has), Toby Flood, Mathew Tait, Lewis Moody and Andy Gomarsall. What a game, what a world cup and what a sport. Rugby rocks. I wish I've put money on Habana at the start of the world cup. 7 wins out of 7. They deserved to be World Champs.